ANAHEIM, Calif. (AP) — After Tampa Bay had two goals waved off by the officials during the second period, coach Jon Cooper figured the Lightning were due for some luck. Jonathan Marchessault provided it and got the Lightning’s California road trip off to a solid start. Marchessault scored the tiebreaking power-play goal, and Jonathan Drouin had a goal and an assist in his return from a six-game injury absence in Tampa Bay’s 2-1 victory over the Anaheim Ducks on Wednesday night. Ben Bishop made 32 saves for the Lightning, who opened the three-game West Coast trip with their fourth victory in six games. Bishop was solid throughout a defense-dominated game, and the Lightning beat the Ducks for the fourth straight time and the second time in two weeks, following a 5-0 win in Tampa. 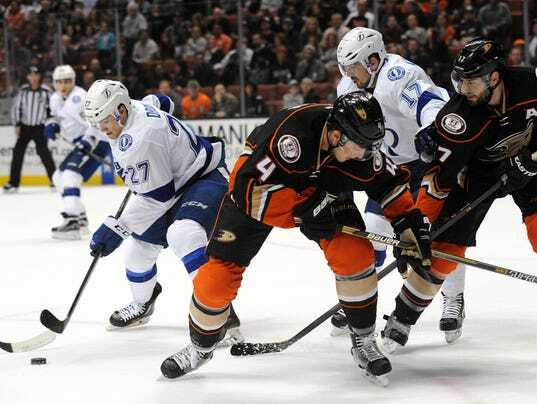 The Lightning improved to 7-0-4 against the Ducks since January 2009.